The time has come and gone for 2017's free science classes (FSC) at the Port Townsend Marine Science Center (PTMSC). Free science classes have been going strong for the past nine years, and this year was no exception. The AmeriCorps led program provides science classes for local schools free of charge. FSC are important as some schools do not introduce inquiry-based science curricula until 5th or 6th grade. Throughout the program, with the help of essential volunteers, AmeriCorps led bird and barnacle based science classes to 3rd and 4th graders. 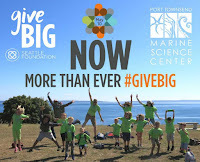 Free science classes are a grant funded program made available by the Wells Fargo Foundation, the MacRae Foundation, and the Dietze Charitable Foundation; this funding is essential as more school funding is cut and field trip budgets are slashed. Programs such as FSC provide a memorable field trip for the students while they employ new aspects of logistical and scientific reasoning. AmeriCorps Juhi LaFuente working with students from Queen of Angels. I headed the FSC ship’s course this year, working with my fellow AmeriCorps to decide the curriculum. I took a lead role in organizing the classes; the first time I have experienced something like this. A total of seven schools made eleven visits to the PTMSC, giving us an opportunity to introduce new concepts and styles of thinking to these wonderful youths through FSC. 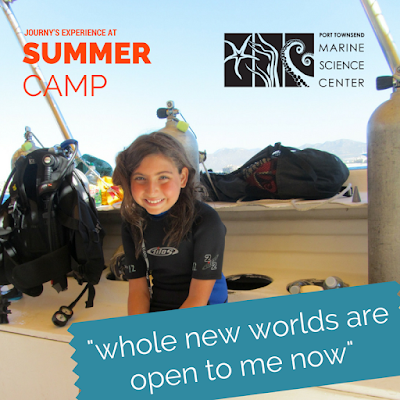 This year’s Free Science Classes were Barnacle Lab and Birds of Shore and Sea. Barnacle Lab is an introduction to the scientific method where students brainstorm simple, harmless experiment ideas, and then perform them on their own terms. They were so interested! The barnacles were a fun thing for them to experience. The class Birds of Shore and Sea exposes children to science in their backyard. They learned how to use binoculars, spot bird anatomical differences and derive their purpose. An outstanding moment I recall is teaching the scientific method to 2nd and 3rd graders. The scientific method is a complex and abstract idea for students in this age group, and I was amazed at how quickly they picked it up and how excited they were to complete an experiment on their barnacle friends. Juhi LaFuente, Marine Exhibit Educator AmeriCorps, noted how excited these naturally inquisitive children were, asking loads of interesting questions during classes they normally would not get a chance to take part in. AmeriCorps Matthew (Mattie) Stephens instructing Barnacle Lab. Sarah Croston, Natural History Exhibit Educator AmeriCorps, feels the impact on children visiting PTMSC for FSC is powerful. Through small things like using binoculars for the first time, or larger moments like marking previously unnoticed differences in bird anatomy, children dive into the science and excel. During activities like bird-watching, children can learn the value of scientific observation in everyday instances. Sarah recalls the excitement of the students as three bald eagles made an appearance as a true mark of the value of the classes. AmeriCorps Sarah Croston choosing an eager class volunteer. The outstanding impact of FSC was "the opportunity for students who would not otherwise get hands on experience in science in the world outside of a traditional classroom setting," says Brooke Askey, Citizen Science Coordinator AmeriCorps. The effects Brooke could see were a lot for students getting excited about the marine environment in aspects they had never seen before. Introducing new concepts to kids and see them applying those to other things in their lives later on, like adaptations in the bird class, is a cool feeling. After the classes wound down, a post-exam was issued to gauge the level of learning. On average, the students increase in knowledge was impressive. The field trip itself is an incredible experience for young people, and the statistics prove that it is a productive and educational time. We would not have this kind of impact if it was not for our fantastic volunteers that lend their time and expertise. Volunteers provide a lot of support for our organization, and their involvement in FSC is a testament to that. FSC were beneficial to the kids as they learned new things and experienced a great program while the AmeriCorps honed and grew their skills in passing knowledge down to younger generations. 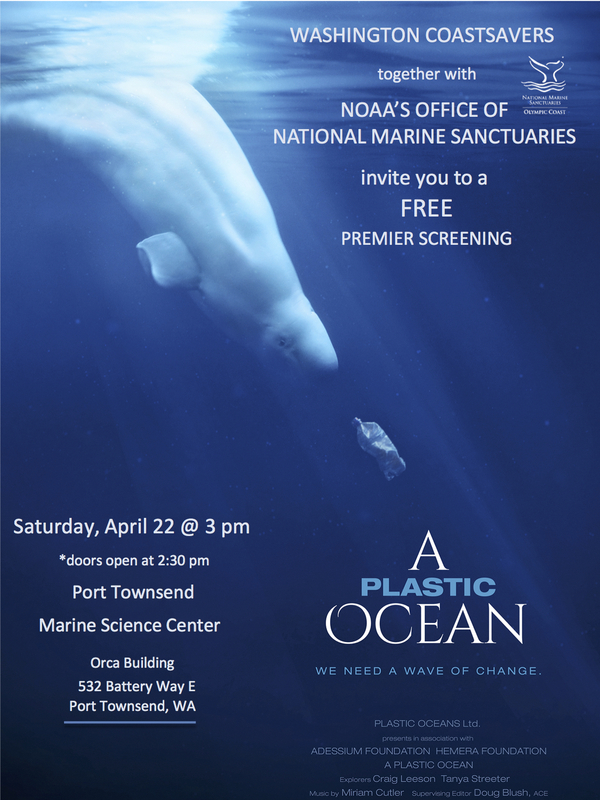 Free science classes are an integral part education and outreach at the PTMSC. At the PTMSC, we stand behind the importance of education of youth. The youth we saw were impressive, and their future looks bright. To see children excited about learning (whether they know they are learning or not) is itself exciting. 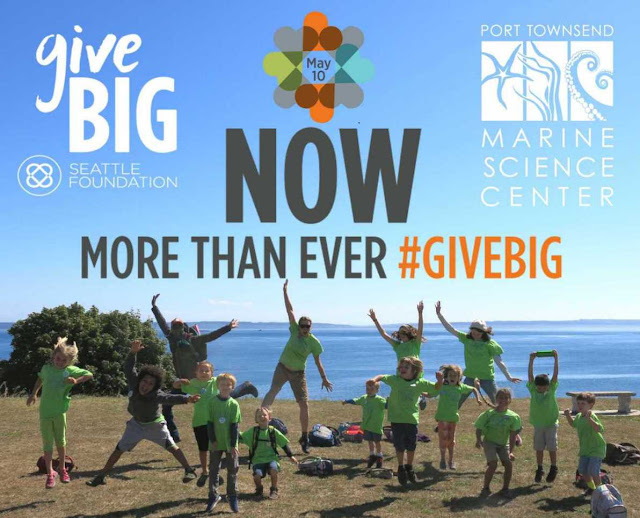 The PTMSC is a kid favorite – interesting marine creatures that most students do not have a chance to observe in detail, a fantastic experience outside of the classroom, a wonderfully helpful volunteer base - and will continue providing FSC and enriching lives. Now is the time to apply for the annual $500 Anne Murphy Ocean Stewardship scholarship for a graduating East Jefferson county senior. Applicants should be graduating from a public or private school, or be a home-schooled student who expects to complete high school by June 2017. The person who wins this scholarship will be selected on the basis of demonstrated interest in science and the environment. Having volunteered on behalf of education about/conservation of the Salish Sea is especially desirable. Applicants need not intend to study marine science to apply. The scholarship may be used for tuition, books, or living expenses for college or vocational school. Please download the scholarship form, answer the questions, and email the application to lslabaugh@ptmsc.org. 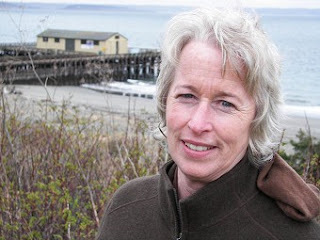 Applications may also be mailed or hand-delivered to Liesl Slabaugh, Development and Marketing Director, PTMSC, 582 Battery Way, Port Townsend, WA 98368 by May 15, 2017. 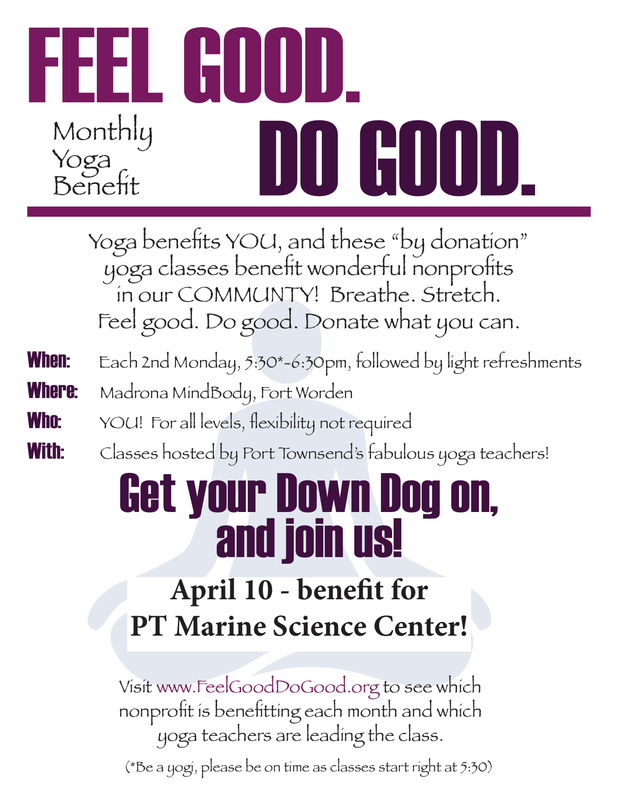 The Port Townsend Marine Science Center is excited to partner with local yoga teachers for the FEEL GOOD/DO GOOD yoga benefit on Monday, April 10th from 5:30 - 6:30 pm at Madrona MindBody, Fort Worden. This is an “all level” class suitable for everyone. Come stretch and breathe, at the same time you support PTMSC! Donate whatever you can…$10, $20… whatever! You’ll leave refreshed, energized and restored. "The classes support local nonprofits and provide an opportunity for people to experience a wide variety of yoga styles and practices."